George Lucas has been functionally estranged from the Star Wars universe for a few years now, ever since he sold his giant, expensive baby to Disney back in 2012. (In 2015, still clearly stinging, he referred to the deal as selling his kids “to the white slavers”; he later apologized for the comment, but it’s clear that this hasn’t always been a happy split.) 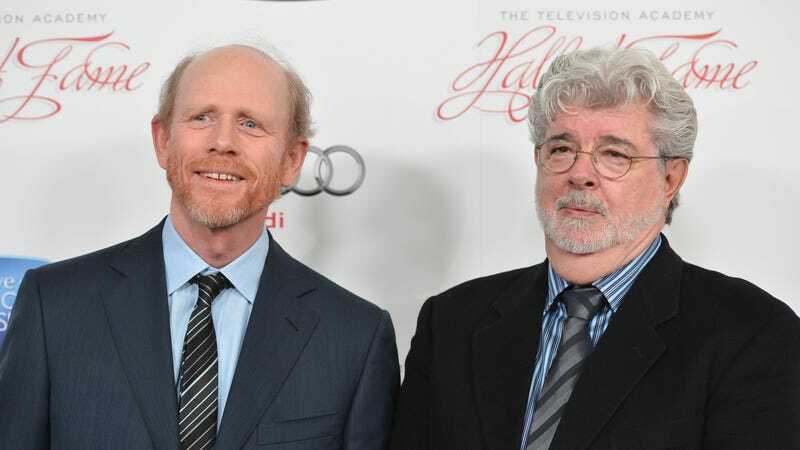 For all that acrimony, though, Lucas is still old friends with one of the franchise’s latest new directors—Ron Howard, who starred in Lucas’ second feature, American Graffiti, and who was brought in to direct Solo: A Star Wars Story last year—and it turns out that he stopped by the upcoming film’s set recently to give his pal a little encouragement, and even pitch a couple of ideas that made it into the movie. This is per a longer piece from Entertainment Weekly, which seems designed at least in part to get fans to stop freaking out about the movie’s big behind-the-scenes conflicts, which broke out last year when Solo’s original directors, Phil Lord and Chris Miller, were fired by Lucasfilm. (Everything’s perfectly all right now. We’re fine. We’re all fine here, now. Thank you.) Howard—who’s careful to praise Lord and Miller’s efforts, while refusing to make any clear delineations between which stuff in the movie is his, and which is theirs—said Lucas stopped by on his first day of filming to give him some emotional support. “He had intended to just kind of stop by and say hi, and he stayed five hours,” said Lucasfilm president (and long-time Lucas collaborator) Kathleen Kennedy. “There’s even one little moment in a scene that—I can’t tell you what, sorry—but in the scene on the Millennium Falcon where George said, ‘Why doesn’t Han just do this.’” Howard, who also consulted with his old pal Harrison Ford on the characterization for the titular space rogue—now played by Aldren Ehrenreich—ended up throwing the moment in, making Solo the first Star Wars movie in years to carry even a hint of Lucas’ direct input as it heads into theaters on May 25.